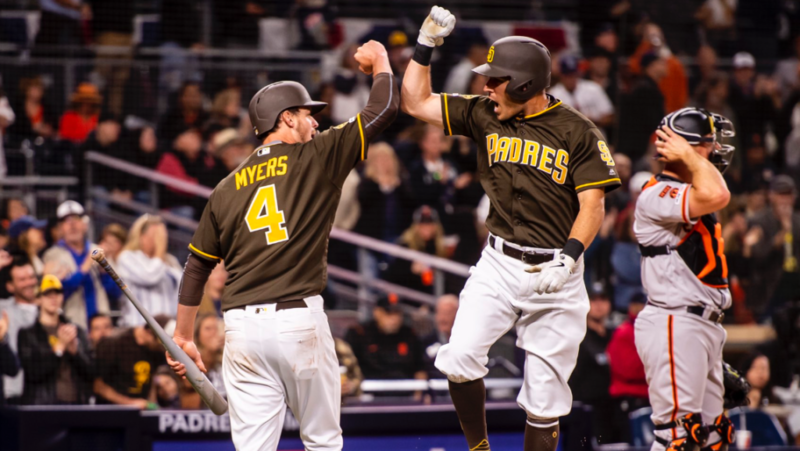 After an exciting Opening Day Victory on Thursday, the Padres donned the fan-favorite brown alternate tops as customary on Fridays at Petco Park for the first time this season to take on the San Francisco Giants. In front of another packed house, Joey Lucchesi took the hill for his first start of 2019 opposite Derek Holland and promptly dismissed the first six Giants in order. It didn’t take long for the Padres to give Lucchesi some support. 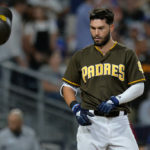 In the second inning, Eric Hosmer led off with a double before Fernando Tatis Jr. flirted with his first major league home run but had to settle with a double off of the wall. Manuel Margot displayed excellent plate discipline and shot a ground ball to fight field, giving the Friars a 2-0 thanks to the speed of Tatis, who scored from second. In the third, Lucchesi got into a small jam before a combination of lousy baserunning by Steven Duggar at second and heads up fielding by Tatis nailed Duggar trying to go to third on a ground ball. That essentially killed any rally the Giants had hopes of conjuring. 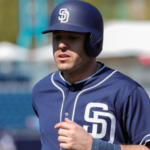 Ian Kinsler reworded the pitching and defense with a leadoff home run to start the bottom of the third, giving San Diego a 3-0 lead early. The Padres got another run in the fifth after Wil Myers came around to score after doubling. Thanks to Manny Machado’s first hit as a Padre, Myers moved over to third in time for Franmil Reyes to hit a sacrifice fly, making it 4-0. All of San Diego exhaled with Manny after an 0-5 start with four strikeouts to start his Friars career. He would get another base hit and finish 2-4. Wil Myers continued his red-hot start with two more hits on Friday, with that double and a single and a run scored. 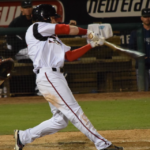 After Lucchesi allowed a single to former Padre Yangervjs Solarte, Andy Green went to Robert Stock to finish the sixth, which then broke a franchise record for most scoreless innings to start a season. 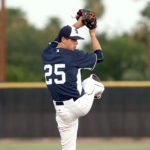 Stock pitched 1 2/3 innings of perfect ball with two strikeouts. Trey Wingenter added a scoreless inning of his own. Lucchesi finished with seven strikeouts while allowing just three hits and walking two. 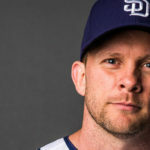 The Padres' much maligned pitching staff has pitched 15 scoreless innings this season, which is the longest season-opening streak in franchise history. Of course. 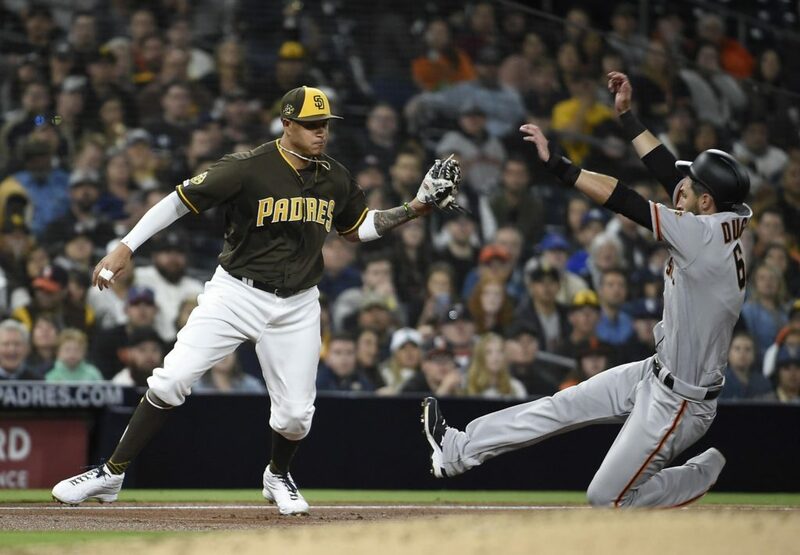 Things got a bit uncomfortable for the Padres in the ninth inning when Evan Longoria ended the record-breaking scoreless inning streak with a leadoff homer off of Phil Maton. Andy Green promptly went to Kirby Yates to shut the door. 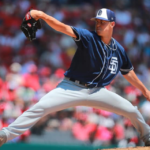 He too struggled with command at first, eventually loading the bases before buckling down to get Gerardo Parra and Brandon Belt both looking at strike three, Belt’s ended the game and gave the Padres an exciting 4-1 victory and Yates his second save in as many games. 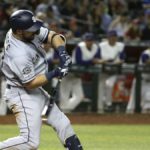 The Padres have not started 2-0 since 2011. There is no denying the confidence this young team is gaining with each at-bat, pitch and inning. The Padres go for their first opening series win since 2011 tomorrow night. Nick Margevicius makes his major league debut against the Giants on Saturday at 5:40 pm. He faces off against Dereck Rodriguez, who had a 2.81 ERA in 21 games last season.